For this series, we aim to go through the different phases at IFD, from the phase were ninjas were popular, to ones where they tried out kickboxing tint to their cut and paste movies and created their own superhero etc but for episode 2 we’ll stay in ninja territory to give you all yet another aural examination of cut and paste ninja action fun. Fun that is enhanced by the fact that paired up with the IFD footage are genres hardly associated with ninja action: horror and melodrama. So therefore we are discussing Diamond Ninja Force and Ninja Commandments for this episode. With Kenny B and Ed Glaser, the owner and president of Neon Harbour and director of Ninja The Mission Force. 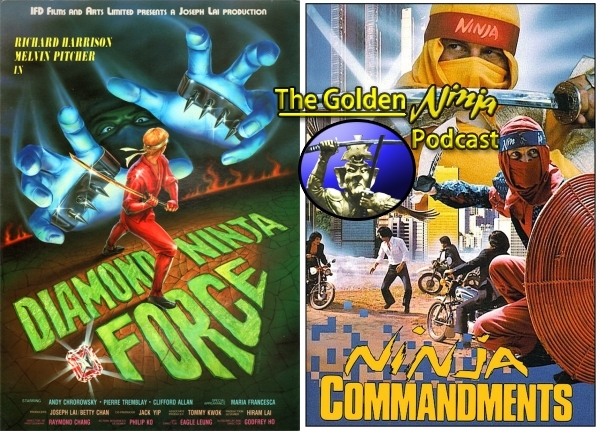 Golden Ninja Warrior Chronicles on Ninja Commandments and Ma! Don’t Die On My Back. A bit of trivia: the woman who plays Harrison’s wife in Ninja Terminator and Diamond Ninja Force was his actual wife, Francesca. She also makes a brief appearance in the Filipino vigilante outing Fireback, of which Harrison is also the star. Fantastic info! Thank you and thank you for listening. Wow, that is so cool! Unless there were several releases in France, I think there was only a 1.33 version but Japan came through (and Lai had 2.35 elements thankfully). How cool! If Google Translate can be trusted, Nanarland’s page for Diamond Ninja Force states that only one particular (French)VHS release was in the proper 2.35:1 aspect ratio. The rest were pan-and-scanned, and in one case to amusingly disastrous results. Thank you very much. That is very plausible indeed. Would love the Japan one though, probably the best quality but am not particuarly picky.